We have been involved in commercial dry cleaning services since we started business nearly forty years ago. We work with all types of businesses from small retail outlets with just the owner, to corporate entities with several hundred employees. Our dry cleaning service and full service laundry helps keep businesses running across the country. From Bakers to Bankers, Guesthouses to Pharmaceuticals we have managed to service every garment imaginable from a wide array of businesses and companies. We are very approachable and understand that sometimes businesses may be researching the possibility of outsourcing their laundry requirements or changing from a service provider to another. From Bakers to Bankers, Guesthouses to Pharmaceuticals we have managed to service every garment imaginable from a wide array of businesses and companies.We understand businesses, we are one ourselves. We understand budgets, time constraints and service level agreements. Our quality and service we believe are second to none. We listen to our clients and we learn to understand their requirements and business needs. We formulate plans and budgets to suit their circumstances and then change them if need be. Even if a business is only considering outsourcing their laundry we are more than happy to assist them in trialing our services to see if suits their particular circumstances. We are often approached by customers that may have a particular need in cleaning uniforms, lab coats or many different fabrics that require extra special care with dry cleaning. Our modern state of the art dry cleaning process is vey fast for those that require quick turn around times. Our cleaning process is also very tough even on the most stubborn of stains that can be caused in business or industrial environments. It is also very gentle on fabrics so that wear and tear does not become an issue during regular cleaning . This ultimately adds to the longevity of the garments and saves the enduser having to replace items as often. We are very conscious of offering value for money without sacrificing quality. It’s one of the many reasons Gills Dry Cleaners and Full Service Laundry are the preferred choice for many businesses across the country. Our Dry Cleaning and Full Service Laundry services are comprehensive. We take nothing for granted and work with you our customer to come up with a workable solution for your laundry requirements. We see every day how our services have an impact on the businesses we support. Our full service laundry is very efficient in terms of speed, convenience and cost. It saves our customers money on their day to day expenses and provides them with a quantifiable cost on exactly what their laundry expenditure should be. By moving laundry requirements from “in-house” to our full service laundry, there are multiple benefits. Staff are freed up to perform other duties while electricity costs, gas bills and detergent requirements for laundry can be eliminated. Capital expenditure, repairs on equipment and space requirements are reduced drastically to the business owners advantage. Outsourcing your requirements to Gills Dry Cleaners can truly make a difference to your bottom line. 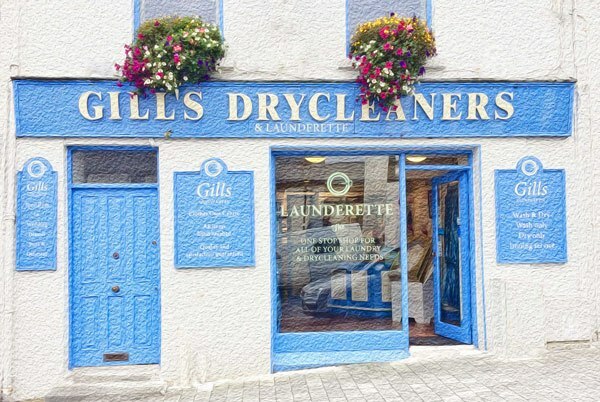 Frank and Martina Gill are the owners and operators of Gills Dry Cleaning and Laundry Services. They are always approachable and always reachable. Don’t let an opportunity slip by to save costs, improve efficiencies and run your business better.